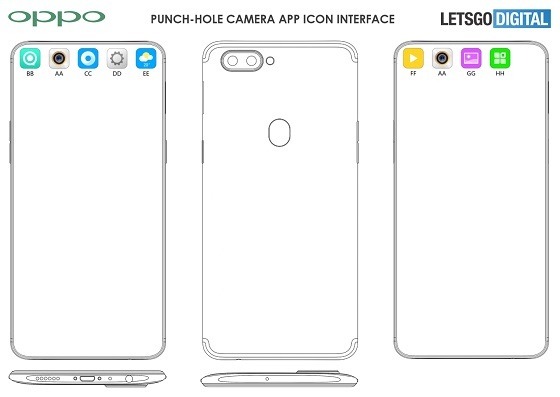 The punch hole camera is the next evolution of the selfie camera after the notch, but the always present hole in an active display presents both a challenge and opportunity for smartphone OEMs who have come up with various ways to enhance the hole. We have seen Samsung show an animation around the hole and using the overlying screen to activate the camera app on the Samsung Galaxy A8s. Now Oppo has taken that idea to the extreme with a new design patent uncovered by LetsGoDigital. Instead of simply using the area as a status bar, they would show a camera icon around the hole permanently, making it quick, easy and intuitive to activate the camera. A swipe on the area would, in addition, reveal up to 5 more icons, which can then be used to activate those applications. In this way, the punch hole camera sets itself apart from the notch in that while it does take up display space, the touch screen over the hole remain active and accessible, unlike the notch, where this area is completely unresponsive. 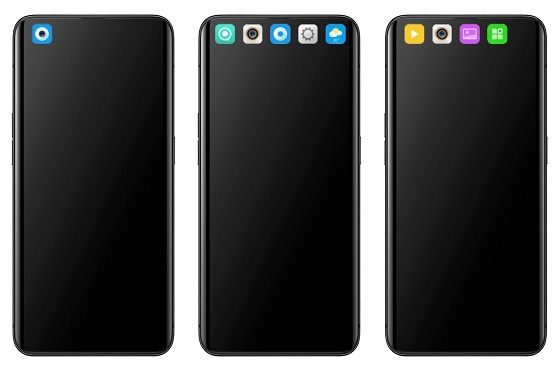 Oppo is expected to announce the OPPO F19 and F19 Pro at Mobile World Congress 2019, with these devices expected to feature 10 x optical zoom. These devices may also feature punch hole front-facing cameras with this new user interface.